A widely circulated, chain e-mail about the health-reform bill passed by a House committee "contains 48 claims. Twenty-six of them are false and the rest mostly misleading. Only four are true," the independent, nonpartisan analysts at FactCheck.org say in their latest post. Among the lies: A government committee will decide what treatments individual patients will get, illegal aliens will get free care, and "The federal government will have direct, real-time access to all individual bank accounts for electronic funds transfer." Repeating: These are lies. "We can trace the origins of this collection of claims to a conservative blogger who issued his instant and mostly mistaken analyses as brief 'tweets' sent via Twitter as he was paging through the 1,017-page bill," Brooks Jackson, Lori Robertson and Jess Henig write. "The claims have been embraced as true and posted on hundreds of Web sites, and forwarded in the form of chain e-mails countless times. But there’s hardly any truth in them." We've said it before and we'll say it again: It is the responsibility of all news media, large and small, urban and rural, to set the record straight on the biggest issue of our day. We trust FactCheck, and you can, too. Independence Middle School sixth graders in Raleigh County, West Virginia, began classes this week in gender-specific rooms. According to Jackie Ayres of The Register-Herald in Beckley, the students will receive separate instruction in the core subjects of math, science, social studies and history. Independence is the first school in the county to try gender-based education, Ayres reports. Davis and Gold report GreenHunter Energy Inc. has halted production and may have to sell its year-old Houston biodiesel plant. Dozens of other plants have also stopped production because biodiesel production is no longer economical, the Journal reports. The Environmental Protection Agency is several months late in issuing regulations for blending of biodiesel with regular diesel fuel. Biodiesel isn't the only biofuel in the lurch. A federal jury recently found that Cello Energy, which was supposed to account for 70 percent of the U. S. cellulosic biofuel supply, had defrauded investors. Ethanol is also hurting, but is somewhat insulated by a federal subsidy. While American farms have proven more adept at weathering the economic recession that most industries until now, U. S. Department of Agriculture projections show it isn't immune to the downturn. USDA projected yesterday that there will be a 38 percent fall in U.S. farm income this year. "This is going to be a very unusual year for farm income with much larger than expected declines," USDA economist Jim Johnson told USDA Daily Radio News. Keith Good of FarmPolicy.com reports, "The 2009 forecast is $9 billion below the average of $63.2 billion in net farm income earned in the previous 10 years." Scott Kilman and Lauren Etter note in The Wall Street Journal that the economic downturn hasn't affected all farmers equally. The pair write that harvest problems in India have led to the highest sugar prices in 28 years for U. S. farmers, but shrinking foreign demand and low prices have left U. S. dairy and hog farmers "barely holding on." Nichols and O'Grady report that "power companies are reducing use of coal plants because of declining demand from heavy industry, the economic sector hit hardest by the recession." Due to the increased availability of natural gas and other alternative energy sources the loss of this industrial "baseload" appears long term. Some electric companies are already trimming their plans to expand coal-fired generation and at least one has begun replacing some of its coal plants with gas units, Nichols and O'Grady note. Coal's hope for a rebound might be a quick improvement of the economy and industry before natural gas and "cleaner" forms of energy have the ability to cope with the demand, they write. Can coal make electricity without being burned? A group of researchers and companies are working to develop technology that may solve the "clean coal" conundrum. Some skeptics of clean coal say the only way to create clean coal is to stop burning it, and Jessica Leber of Climate Wire writes for The New York Times reports that some researchers believe they can do just that. These scientists are working with "direct carbon" fuel cells (DCFCs) to produce electricity directly from the carbon source by potentially using half the coal burned today. Dan Raster, energy-storage manager for the utility-funded Electric Power Research Institute, acknowledged to Leber that major hurdles exist to developing DCFC technology, but he thinks it will provide an "attractive option to electric utilities that need to reduce their carbon emissions." DCFCs "convert carbon sources to electricity in a single reaction step, just as current fuel cells do with hydrogen," Leber writes, noting that the process is more efficient than plants that burn coal to make steam that drives turbines. The Spencer School District's plan to offer a constitutionally valid Bible course is believed to be the first such attempt at outlining religious freedoms in an Iowa public school. Georgia, Texas and other states have seen school systems adopt similar policies, Hupp reports. In a 2007 Time magazine cover story that detailed the rising trend of teaching Bible literacy courses in public schools, David Van Biema reported that a textbook called "The Bible and Its Influence" had been adopted by many schools as a vehicle to teach the Bible's historical context in the United States. According to the Bible Literacy Project, the creator of the book, it is used in 330 schools across 43 states. In October 2007, Alabama became the first state to approve a textbook for academic study of the Bible when it designated "The Bible and Its Influence" available with purchase of state funds. The Society of Environmental Journalists has both praised and panned the Environmental Protection Agency for making available the raw Toxic Release Inventory data for 2008. SEJ writes in a post on its Web site that the release of the data was with "a promptness unprecedented in the history of the program that some took as a sign the agency was trying hard to reverse Bush-era secrecy." The new release isn't without its problems, though. SEJ writes that EPA has sacrificed increased interpretation of the data for the speed of release. SEJ reports that a "certain amount of the data submitted by industry is inaccurate, incomplete and improperly formatted." SEJ warns journalists that the raw data will require increased "ground-truthing" on their part before use. In January, Ken Ward Jr. of the Charleston Gazette reported that the Environmental Integrity Project had used Toxic Release Inventory data to determine that West Virginia was home to dozens of coal-ash impoundments that take in more toxic waste from power plants than the Tennessee Valley Authority Kingston Fossil Plant impoundment that broke in December 2008. Ward reported that the Environmental Integrity Project said the impoundments "pose the threat not only of catastrophic failure, but also of a "slow poisoning" of groundwater supplies with heavy metals and other toxics." The EPA said in a news release that it has taken the "unprecedented step of releasing the raw data prior to completing its analysis," but "is analyzing the data and will publish the national analysis once its completed." The Toxic Release Inventory contains information on the release of more than 650 chemicals and chemical categories from industries across the country. We're choosy about passing along stories from The Associated Press because they get very wide circulation, but this one by Justin Juozapavicius out of Tulsa commands our attention and, we hope, yours: "This is the new formula for methamphetamine: a two-liter soda bottle, a few handfuls of cold pills and some noxious chemicals. Shake the bottle and the volatile reaction produces one of the world's most addictive drugs." We've reported on the "shake and bake" way to make methampehtamine, but that's the best lede we've seen. And there's real news: "An Associated Press review of lab seizures and interviews with state and federal law enforcement agents found that the new method is rapidly spreading across the nation's midsection and is contributing to a spike in the number of meth cases after years of declining arrests." Storytelling with Narratives in Print and Pictures, workshop for journalists, Oct. 2 in Lexington, Ky.
Storytelling is as old as the human race, and one of the things that makes us human. It is also something that could be crucial to the future of newspapers, whether through narrative accounts of people’s lives; new, digital forms using photography, audio and video; or multimedia combinations. A recent example is this package on Alabama loggers from The Washington Post. Or, going back a few years, this story by Rick Bragg in The New York Times on a tornado killing worshippers at a church. 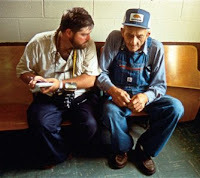 To help community newspapers tell stories in new ways, or ways that may be new to them, The Institute for Rural Journalism and Community Issues will present a one-day workshop, “Storytelling with Narratives in Print and Pictures,” at the University of Kentucky in Lexington Friday, Oct. 2. The earlybird registration deadline, with a reduced fee, is Sept. 4. The storytellers will be Stephen G. Bloom, left, author and journalism professor at the University of Iowa and writer for The Oxford Project, a 2008 book of photographs and narratives of the people of Oxford, Iowa; photographer David Stephenson, who recently left the Lexington Herald-Leader after helping the newspaper break new ground in storytelling with audio, video and still photography; and Amy Wilson, feature writer and roving rural reporter for the Herald-Leader and former reporter for the Orange County Register in California. The idea for the workshop began with Bloom, who hopes to help community newspapers, especially those in rural America, publish the kind of deeply personal narratives that are part of The Oxford Project, which has won widespread praise. Filmmaker Ken Burns said of it, “This powerful confessional book draws its strength from the truth that so-called ordinary people, not those with bold-faced names, are actually the heroes of our American drama." Hank Steuver of The Washington Post wrote, “People don’t get much more real than this.” More information on the book is available at http://www.oxfordproject.com/. Wilson, left, and Stephenson, right, have won many awards and have collaborated on several multimedia stories for the Herald-Leader, some of which are at http://www.davidstephenson.com/. “We are lucky and proud to have such a great lineup of experts,” said Al Cross, director of the Institute. “They will help rural journalists tell compelling stories in a variety of ways, which our business increasingly demands.” For a PDF with more about the workshop and a registration form, click here. For more information, contact Cross at 859-257-3744 or al.cross@uky.edu. 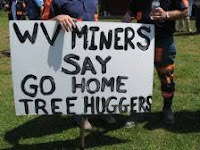 Peterson profiles two men on opposite sides of the debate as she explores the historical implications of the controversy: Jess Baldwin, a foreman on a Pritchard Mining mountaintop job, and Chuck Nelson, a retired miner involved with Coal River Mountain Watch and the Ohio Valley Environmental Coalition, who sees coal mining as the opposite of progress. "Both men agree that things are heating up in the coal fields," Peterson reports. "Nelson has been attending and organizing mountaintop removal protests for several years, but he hasn't seen a lot of coal miner opposition until recently." She says "both predict violence in the coalfields," and quotes Baldwin: "The men are going to start to stand up. It’s going to come to a brutal end. It is, it’s going to come to a physical thing." Nelson agrees: "It’s a wonder somebody hasn’t really got hurt bad already." Violence has already shown up at least once in the region, at Marsh Fork Elementary School on June 23, when Ruth Tucker allegedly slapped Coal River Mountain Watch Co-Director Judy Bonds. Ken Ward Jr. of The Charleston Gazette reported in June that Tucker had been charged with battery for her role in the incident.